This textbook is suitable for the following courses: International Business and Introduction to Global Business. 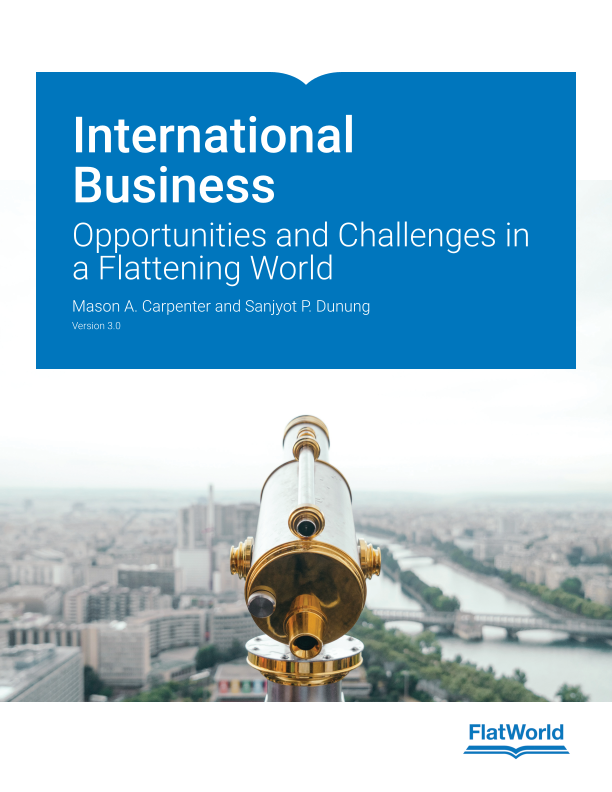 Blending the authors’ two unique backgrounds—one as an academic and the other as a practitioner— Carpenter and Dunung present a fresh approach to the subject of international business. This textbook not only provides the foundation for the subject, but also helps today’s learners understand what is really relevant in today’s constantly changing global business arena. The authors stress the importances of seeing borders as bridges, and not barriers, as they encourage entrepreneurship and discuss strategy. Up-to-date facts, statistics, and analysis. New coverage of the ongoing changes in business and economics and their impact on cultural environments. Updated information on the emerging markets, including markets in the Gulf and in Africa. New analyses and perspectives on global businesses and their evolution. Focus on the practical application of theory and information throughout the text. Current and topical opening cases. “Did You Know?” factoids about international business and local cultures. “An Eye on Ethics” sections that provide examples of ethical issues that arise in international business. End-of-chapter summaries including review questions, experiential exercises, and ethical dilemmas. Closing section with specific and practical tools related to international business with supplemental support materials from each chapter. 1.1 What Is International Business? 1.2 Who Is Interested In International Business? 1.3 What Forms Do International Businesses Take? 2.1 What Is International Trade Theory? 3.2 What Are The Key Methods Used To Describe Cultures? 6.1 What Is The International Monetary System? 7.1 What Do We Mean By Currency And Foreign Exchange? 9.1 What Are Importing And Exporting? 9.5 What Options Do Companies Have For Export And Import Financing? 11.2 What Do Entrepreneurs Do? Sanjyot is president of Atma Global (www.atmaglobal.com), a publisher of innovative, multimedia learning content, products, and solutions for the corporate, higher education, and K-12 markets, focusing on countries, cultures, and global business issues. The firm’s mission is to develop best-of-class, engaging learning solutions and products to enable people of all ages understand and successfully interact with people from other cultures. Additionally, the firm's Cultural Advisory Services provides thought leadership and assists global institutions in understanding the impact of culture on their global operations and objectives. Sanjyot is a recognized leader in the field of cross-cultural learning and has more than fifteen years of extensive experience in developing leading-edge, multimedia content learning solutions. Sanjyot also periodically authors articles on doing business internationally and entrepreneurship. Further, she has appeared on CNBC-TV, CNN International, Bloomberg TV, and various radio programs and is often a guest speaker at conferences and seminars addressing international business, global cultures, and entrepreneurship. Notably, she is the author of more than fifteen books, including: Doing Business in Asia: The Complete Guide, focusing on the cultural issues of conducting business in twenty Asian countries (1995 and 1998 by Simon & Schuster); Straight Talk About Starting and Growing Your Own Business (McGraw Hill, 2005); Starting Your Business and Growing Your Business (Business Expert Press, 2010); International Business (Flat World, 2011); and, bWise: Business Wisdom Worldwide Series (select titles Atma Global, 2015). Sanjyot began her career as a banker in with American and Japanese banks. Sanjyot was selected as a protégé member of the Committee of 200. She’s cofounder and president of the Dunung-Singh Foundation, committed to providing educational opportunities and hope to underprivileged children. She also served as a member of the board of directors of the US Committee for UNICEF (United Nations Children’s Fund). Sanjyot mentors Afghan women entrepreneurs through Project Artemis. Sanjyot’s academic history includes a BA from Northwestern University and an MBA, with an emphasis in international finance, from Thunderbird, School of Global Management. She is the school’s 1997 recipient of the Distinguished Alumni award. Sanjyot was born in India; was raised in Liverpool, England, and Chicago; and now lives in New York with her three sons.